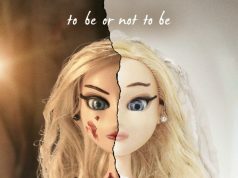 Whether scary or romantic, tragic or funny, vampires have never really gone out of fashion in pop culture, but the latest fanged creature coming to life (sic!) on TV also happens to be absolutely adorable. 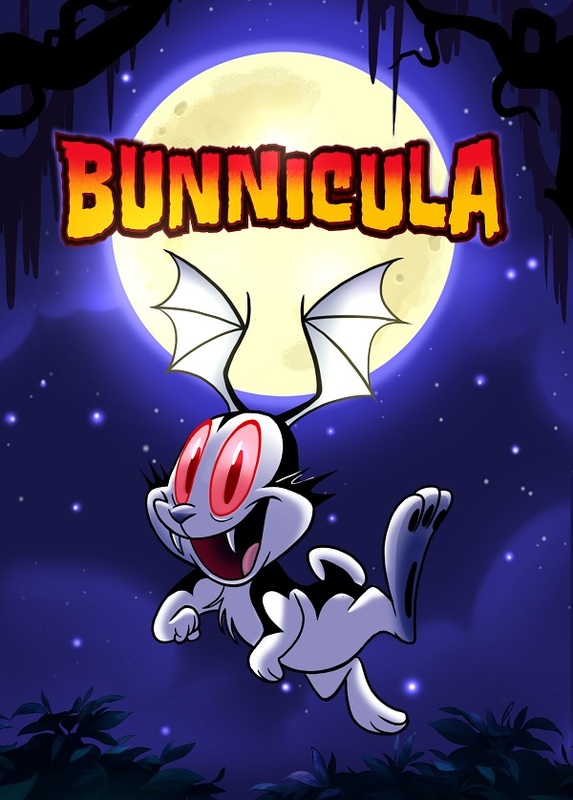 The protagonist of the new Cartoon Network series „Bunnicula” is a vegetarian vampire bunny who lives with his owner Mina (a nod to the original „Dracula” novel by Bram Stoker) and her other pets. Producer/director Jessica Borutski previously worked on „The Looney Tunes Show” and „Wabbit: A Looney Tunes Production”, so we could say she’s already a veteran of dealing with cartoon rabbits. Family animation and horror movie monsters: how do these flavours go together? Jessica told us a bit about the challenges of the „Bunnicula” recipe. What do you think, what is it about vampires that makes them such appealing characters? Jessica: I think people- we have a fascination with the un-dead, we love the idea of a creature that’s un-dead and can live forever! It’s also the terror of a creature that thrives off the living. Bunnicula thrives off vegetables, so he’s not as scary (laughs). What do you think will attract international audiences to the show? Especially since they may not be familiar with the original books. Jessica: I think that the appeal will be the fact that Bunnicula is a very cute little bunny, but at the drop of a dime he can become a scary demon! And I think that contradiction will be very interesting for people, and the adventures that he gets are spooky and scary, but they are also fun and cartoony. So the whole show plays off that juxtaposition. 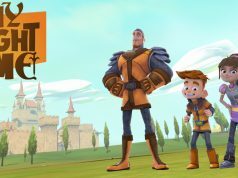 This is a series for young audiences, but by the sound of it, it will also reference a lot of horror and monster movie tropes. How do you manage to have fun with these things and avoid ending up with angry parents at your door because you’ve made the content too scary? Jessica: When we design these characters, we always make sure we’re not creating terrifying-looking creatures, they’re more cartoony and fun, it’s more spooky-fun than spooky-scary. And then, even when we have a tense moment in the show, we can always break it up. One of our characters, Harold the dog, he’s kind of silly, so he’ll probably make a silly comment, and that kind of breaks the tension in scary scenarios like that. Kids’ shows are often expected to have a message, a moral, to teach a lesson. Will Bunnicula have moral lessons, or will you be looking to subvert this, or…? Jessica: We don’t have an overall message that we’re trying to deliver to children. I think each episode has its kind of „lesson of the day” with the characters. One that comes in my mind: Chester [the cat], he realizes he has to be himself, it’s OK to be yourself. Every show has a mini-message, because it’s always about three friends, they go through something and they fight, and they all work it out in the end. It’s all about friendship and being good to your friends- looking out for each other is probably the main message. Or…I shouldn’t say message, I would say re-occurring theme. I remember seeing one of your old short films [The Good Little Bunny with the Big Bad Teeth], which was also about a rabbit! And it had quite a sarcastic humour to it. How much of your own sense of humour and sensibilities were you able to bring into this project? How did you develop the visual aesthetic of the show? What kind of universe were you trying to create? Jessica: It’s based mostly on my style. 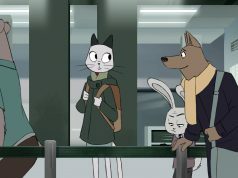 If you noticed the bunny from the short film I made, it’s like Bunnicula, but more like a normal rabbit, with a thicker line. Then I just drew Bunnicula the way I would design him for myself, the whole show sort of plays off my style, and other artists that come on, you know, they give their takes. The backgrounds, we wanted to create a richness and a grounded, uh, cartoony-realistic look to them, so that all the crazy stuff that is happening feels like it’s happening in real life, in a grounded setting, and I think that also helps create a nice contrast between what’s happening, it feels more real. The show has already premiered in the US a few months ago; how was it received? Do you read online reactions and comments? Jessica: Yeah, I don’t know where you get any actual ratings or anything, but my executive producer told me that it’s doing very well. And online, most of the comments I’ve had are positive. I think kids are enjoying the show, which is great, because that was our audience, we wanted to make sure kids enjoyed the show. We’ve got some positive feedback, and people enjoy the aesthetic of it, which is good. Were you a fan of the original Bunnicula books, or did coming to this project introduce you to them? Jessica: It was sort of a new discovery for me. I had heard of Bunnicula, at the library when I was a child I remember seeing the book, but I wasn’t a big reader, so I didn’t read it. I was only really introduced to the books about a year ago. But the author sent me the series and I read them, they’re really great. I just had a little boy and I’ll definitely be showing him the series and letting him read those! What kind of cartoons do you like and what are your influences? Jessica: I like a lot of different animation. I’m a huge fan of 30’s and 40’s Disney and Warner Brothers, I also love Miyazaki movies, like „Totoro”, „Spirited Away” is one of my favourite animated movies of all time. I also love a lot of shows that are on TV now, I remember when „Adventure Time” first came out, I loved that, I love…what else do I love? I love a lot of the classic Disney movies, as a kid growing up I probably watched „The Little Mermaid” like, 800 times. I know you also worked on Looney Tunes revivals („The Looney Tunes Show” & „Wabbit”). In recent years there has been a lot of debate about old cartoons, and content deemed inappropriate for modern times because of violence or different social values. How did you negotiate these social changes when reviving classic characters? Jessica: You have to make different content. The characters, their personalities stay the same, but you have to adjust the scenario. When I redesigned them, I just wanted to make them a little bit more sleek, so that they’re visually different and people know that they’re watching a new show. And then, yeah, we were just not able to do violence, you can’t just have a gun and start shooting, you can’t do it on today’s TV, with the ratings, networks have their limitations, so… It’s a very different show. The „Looney Tunes” that we made today is not anything like the „Looney Tunes” of the 1950’s. That’s just the way it has to be, you can’t create cartoons with violence or sexism or racism anymore, and I don’t think we want to make that type of show anymore! Just because we have such a larger audience than we did back then, times are just different, we just stay away from violence. It’s mostly the violence, something that we never do anymore. But would you let your kids watch old Looney Tunes? Jessica: I would show my child the classics. It’s different when you are a parent, you can say: „I’m showing you a cartoon, it’s a cartoon, it’s not real, and you can enjoy it for that.” But I understand why networks don’t want to show them, because they know there’s not always going to be a parent in the room, explaining to the child. To be honest, as a child, all of that stuff went over my head… all of the racist, sexist jokes, I just didn’t understand them. So I think [kids today] watching the original Looney Tunes… that goes over their heads as well. But I mean, networks can’t show them, because then you have angry parents, and that’s a problem. I would definitely show my child all of the 1950’s films, because they’re just beautiful films, they’re funny, and there are no other films like that, so I think to not show them to a child would be a shame.